The documented history of the Kingdom begins with 747 A.D. with Guru Padsambhava also known as Guru Rinpoche who made his legendary trip from Tibet across the mountains flying on a tigress’s back. He arrived in Paro valley at Taktsang Lhakhang also known as Tiger’s Nest. Guru Rinpoche is not only recognized as the founder of the Nyingmapa religious school but also considered to be second Buddha. In the ensuing centuries, many great masters preached the faith resulting in full bloom of Buddhism by the middle ages. 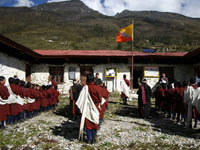 Although sectarian at first, the country was eventually unified under Drukpa Kagyupa sect of Mahayana Buddhism by saint/administrator Shabdrung Ngawang Namgyal in the 17th century. Ngawang Namgyal codified a comprehensive system of laws and built a chain of Dzongs which guarded each valley during unsettled times and now serving as the religious and administrative centre of the region.